Are you an event planner? Need a place to hold a group meeting? Are you organizing a conference? 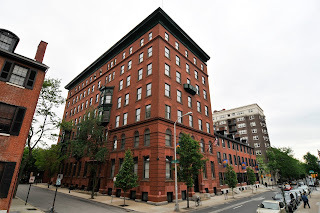 If you're responsible for planning a corporate or personal event in Center City, Philadelphia, and are in search of the perfect spot, consider Peirce College. We have an extensive room rental program and a lot to offer groups for their presentation, conference, and banquet needs. Newly renovated event space. Peirce offers banquet rooms for groups of up to 120 people, meeting rooms for groups of up to 180, and classrooms/training rooms for groups of up to 40. 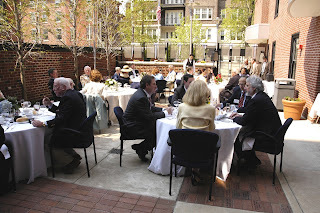 We also offer two open atriums and an attractive outdoor, secured courtyard for receptions. State-of-the-art technology. Our event and meeting spaces feature laptops, desktops, printers, projection systems, high-speed wired and wireless internet, wireless PA system, and podiums with internet. Flexible catering packages. Unlike hotels, which typically offer a limited number of fixed-priced catering menus, we can cater your event to your specifications, whether you just want soda and water, or you need a three-course meal. Proximity to public transportation. Located on Pine Street just off the Avenue of the Arts in Center City, we're conveniently situated close to PATCO and SEPTA stations, with plenty of public parking nearby. Walking distance from a number of hotels. The Doubletree Hotel, The Bellevue Hotel, Radisson Plaza Warwick Hotel, Hyatt at the Bellevue, Holiday Inn Express, Sofitel, and The Latham Hotel are among the accommodations that are a short walk or cab ride from the Peirce campus. Cost of the rental depends on the space, but all expenses include an event coordinator; access to technical support personnel; set-up and breakdown of equipment; housekeeping; security; and easels, flipcharts, and whiteboards. Additionally, all rooms are ADA-accessible. Take a virtual tour of Peirce College. For availability and pricing, please contact me, Vito Chimenti, at 888.GO.PEIRCE, ext. 7368 or email Rentals@Peirce.edu.